Shopper Marketing has been described as one of the key success drivers for companies that want to reach excellence in execution. And sometimes when it comes down to applying it in practice or organizing it into the company, this is not necessarily easy to do. As we described in our last post on Shopper (See post “Build a Shopper Marketing Strategy and Model“), Shopper Marketing can be defined as the use of insights-driven marketing and merchandising initiatives to satisfy the needs of targeted shoppers, enhance the shopping experience, and improve business results and brand equity for retailers and manufacturers. At this point, some organisations already face a challenge when it comes to differentiating between Shopper Marketing and Trade Marketing. To keep it simple, Shopper can be understood as a methodology or approach on how to transform shopper insights into effective commercial actions; while Trade Marketing is usually the name of the department in charge of making the link between Marketing and Sales. But this is not the only difference. In general, since Shopper Marketing tends to be “a philosophy”, there are different ways of approaching it and integrating it into the company’s roles and functions. The boundaries between Shopper Marketing and Brand Marketing or between Shopper and Sales are always fuzzy and can differ from one organisation to another. After developing several Shopper Marketing and Commercial Strategy projects, at Connociam we proposed a framework that can help to understand what Shopper Marketing means in practice and how it can be broken down into functions, roles and processes integrated into your organization’s way of operating. In a general sense, Shopper Marketing should be organised to maximize return of shopper insights to the company and the effective allocation of resources to support sales, taking advantage of the characteristics and needs of each type of point of sale. To carry out this process, we can identify four steps. By dividing the Shopper Marketing approach into four concrete steps we can clarify team roles, gain focus and obtain better results at the Point of Sales. 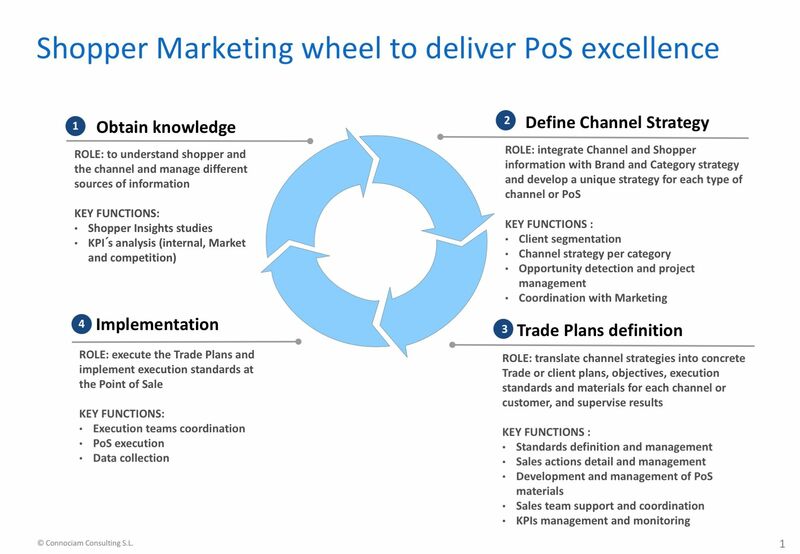 Define Channel Strategy: integrate Channel and Shopper information with Brand and Category strategy and develop a unique strategy for each type of channel or PoS. Channels need to be privatized and some specific channels could be difficult to cover. All these steps can be assigned to a specific team. Depending on the size of the organization, these can be developed by the same team, or split between different functions to ensure a better focus and a deeper knowledge and specialization. When split across the organization, it is crucial to ensure optimal coordination and responsibilities. Clear R&R, process and leadership definition ensure this coordination. One of the keys on execution is to narrow the control scope and specialize functions. Following this principle, the four Shopper Marketing areas outlined above, tend to be organised into 4 different functions as we can see on the following chart. In terms of departments, we see different options on how to organize these 4 functions, according to company characteristics and resources. The way you finally choose to organize the different Shopper Marketing functions within your organisation may vary depending on your Shopper maturity and competitive dynamics. However, in any case, you should have a clear vision as to how to split the functions and who you are going to assign them to in order to build a strong Shopper Marketing culture in your organization and make sure you build up strong processes to deliver excellence at the Point of Sale and maximize the value of your brand portfolio at the “moment of truth” or “last three feet”, as many companies call it. Organizing your shopper activities in a smooth and relevant way inside your organisation allows you to optimize your Trade Marketing investment and ensure Point of Sale excellence in execution, two critical success factors for competitive marketing today. Are you ready to install the Shopper Marketing approach in your organization?